A new once-daily dual bronchodilator treatment for chronic obstructive pulmonary disease (COPD) is now available to healthcare professionals in primary care as well as secondary care in England. This milestone marks the availability of Anoro (UMEC/VI) throughout the healthcare system, and online prescribing/dispensing systems have now been updated with Anoro Ellipta 55/22mcg in retail pharmacy and GP practices. Anoro is indicated in the UK as a maintenance bronchodilator treatment to relieve symptoms in adult patients with COPD. Anoro is a combination of two bronchodilators in a single dry powder inhaler, the Ellipta®. It contains umeclidinium (UMEC), a long-acting muscarinic antagonist (LAMA) and vilanterol (VI), a long-acting beta2 agonist (LABA). LAMAs and LABAs can relax airway muscles and improve airflow in and out of the lungs. Approximately 900,000 people are living with a COPD diagnosis in the UK, however, research estimates that it affects as many as 3.7 million individuals. The disease is the fifth leading cause of death in the UK and the NHS spends over £800 million annually treating and caring for people with COPD. 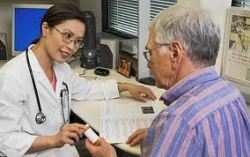 “COPD is a complex condition requiring a detailed understanding of each patient’s needs. Breathlessness is often a key symptom that can significantly impact a patient’s quality of life, but one that could be managed better, and a critical goal in the management of COPD is to maximise lung function. Anoro offers clinicians with a new option to help better tailor treatment approaches to individual patients and their symptom management. The availability of Anoro’s dual bronchodilation in one inhaler is a welcome addition to our armoury in the fight against this debilitating condition” comments Dr Doytchin Dimov, Consultant Physician in Respiratory Disease and Clinical Lead for COPD, Leeds Teaching Hospitals NHS Trust.